South Korea's finance minister held a meeting with senior officials Sunday to discuss pending issues, including a former ministry official who claimed to be a public-interest whistleblower. The country's finance ministry has filed a complaint against Shin Jae-min, a former official who claimed that the presidential office Cheong Wa Dae abused its power over the country's leading tobacco maker and the finance ministry. 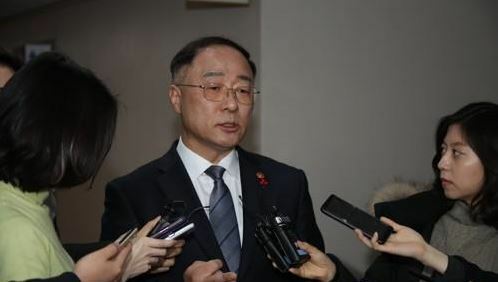 At a weekly meeting, Minister Hong Nam-ki and ministry officials discussed the revelation made by Shin, who disappeared last week after hinting that he would commit suicide. He was later found alive. "There was no discussion about whether the ministry will drop its complaint against Shin," a ministry official said. The 33-year-old Shin claimed that the finance ministry attempted to issue deficit-covering bonds worth 4 trillion won($3.56 billion) in late 2017 under pressure from the presidential office. He insisted that the move was aimed at boosting government debt for fiscal 2017 to make the former Park Geun-hye administration look bad. Park was ousted in March 2017 over a massive corruption scandal and President Moon took office in May of that year. The ministry said it made a final decision not to issue bonds, claiming that there was no "forced order" from above over a possible bond issuance.